Road Trip III 2011: Atlanta Braves Baseball! WARNING: This is a LONG post. I debated dividing it into two parts, but couldn’t find an easy dividing point. So instead I put in some headers to try to break up the story a bit. It was our entire motivation for our trip to Atlanta last weekend: we had Braves tickets! During Jacob’s baseball season, we promised to take him to a professional baseball game in the area. We didn’t realize it would be over an hour away (Mobile, Alabama has a AA team). Dave suggested looking into Braves tickets, and we could take a long weekend in Atlanta for sightseeing. I got a great deal on StubHub.com on a set of four tickets to the August 14th Braves-Cubs game right behind home plate. Someone was probably breaking up a set of multi-game tickets, and I scored some great seats for about $20 each. It turned out to be near Dave’s birthday, so we considered the trip a birthday gift for Dave. Even better? I found us a hotel room right across the street from Turner Field! Whoo hoo! …so excited, in fact, that on Saturday morning Jacob and I walked over to the box office first thing and bought tickets to see the Saturday night game. We took advantage of the Braves’ military promotion — Active duty military can get buy-one-get-one-free Upper Box seats. (So can students and AAA members). And they waived the $3 surcharge for same-day purchase! Our original tickets were to the Sunday afternoon game. Happy Dave. Sandwiches and beer at The Bullpen. $3.50 bottles here vs. $7.00 bottles at the ballpark! Dave opted for a solid red Braves hat. After Friday night at The Varsity, then Saturday morning and afternoon at Stone Mountain, we had dinner Saturday evening at The Bullpen, a burger/beer joint between our hotel and Turner Field. We took a risk heading over there — after all, what restaurant next to the ballpark was going to have seating 90 minutes before gametime? We thought The Bullpen would be waitress-served meals, and were expecting the worst in terms of a wait for a table. We were greeted with a pleasant surprise: cheap food, REALLY cheap beer and plenty of outdoor seating. Sure, it was hot, but at least we had seating. Another nice perk — free parking since we were staying at a hotel nearby. We found out that the local businesses near Turner Field (including our hotel) sold extra parking spaces for $20 per game! So over the weekend we saved $40 in parking charges, and we had a VERY short walk to the field, just diagonally across an intersection from the gates behind home plate….although the main entrance was behind the outfield. It’s a sight to see — that look on a kid’s face when he see something he’s been excited for for so long. I remember that look when my boys met Mickey Mouse. We saw it again when the boys saw the bright green field and the HUGE video screen when we got to our seats. For the Saturday game, we sat near the very top row, but it was essentially behind home plate. It was hot, but at least we had a good enough view to command the boys’ attention for most of the game. The Braves lost the Saturday night game. These giant baseballs were all over the place — the boys wanted to find them all, but we didn’t do that. The boys got Braves hats off a street vendor for $5 each. They are definitely $5 hat quality, but the boys didn’t care and were incredibly excited! I’m very proud of this picture. This is the 1991 Braves in the upper part of the picture. They had a 20th Anniversary reunion event just before the game. This team started the 14-years-in-a-row of pennant winning. Five of the players simultaneously threw ceremonial first pitches and I caught 4 of the 5 balls mid-pitch! From the top row, too! (the 2nd pitcher from the right hadn’t let go of the ball yet). Hooray for our Canon camera! The view from the top. Not bad. 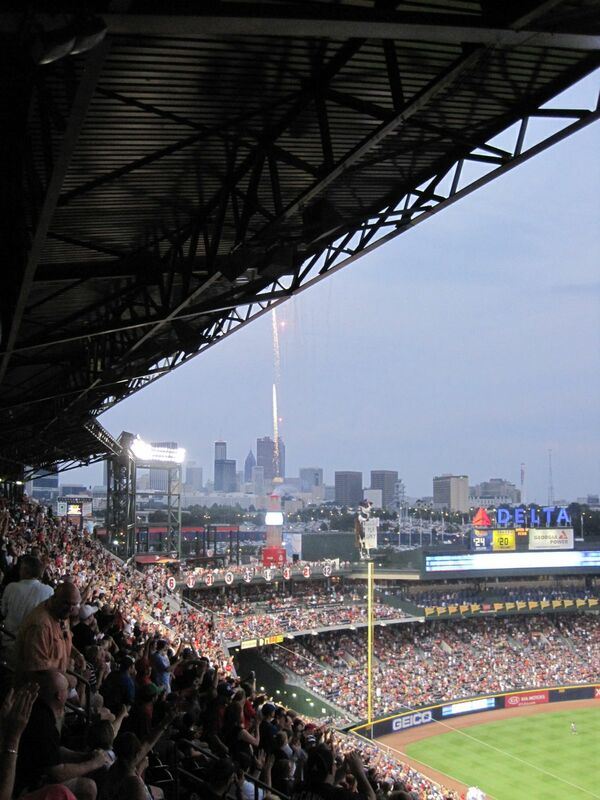 The giant TV screen (“Braves Vision”) helped us see anything we needed to see in more detail. You can see how high up we were. Two of Atlanta’s biggest sponsors, literally: Coca-Cola and Chick-fil-A. Each of those things are 40-feet high. 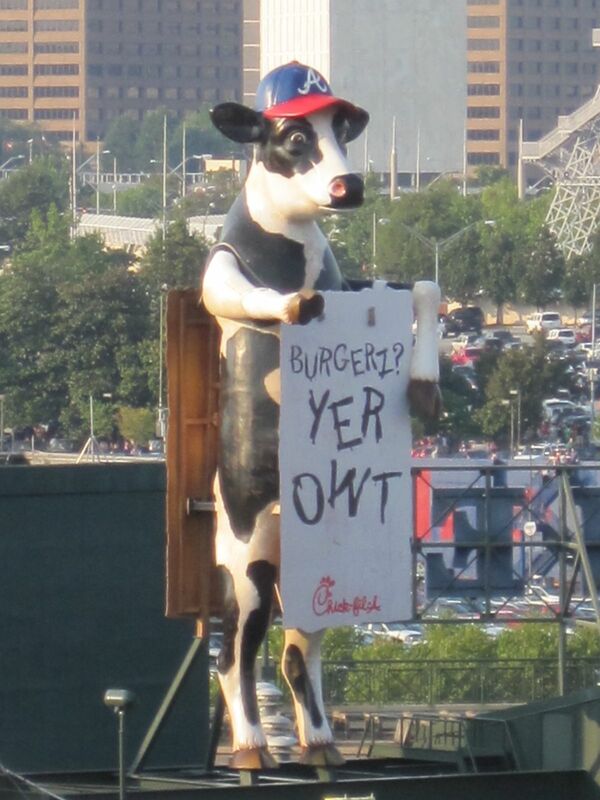 The Chick-fil-A cow does the tomahawk chop with his (her?) right arm when the (FSU Band) music played! The boys all brought in their gloves, but we were sitting a bit high to catch a foul ball. Plenty of gimmicks to keep us entertained. 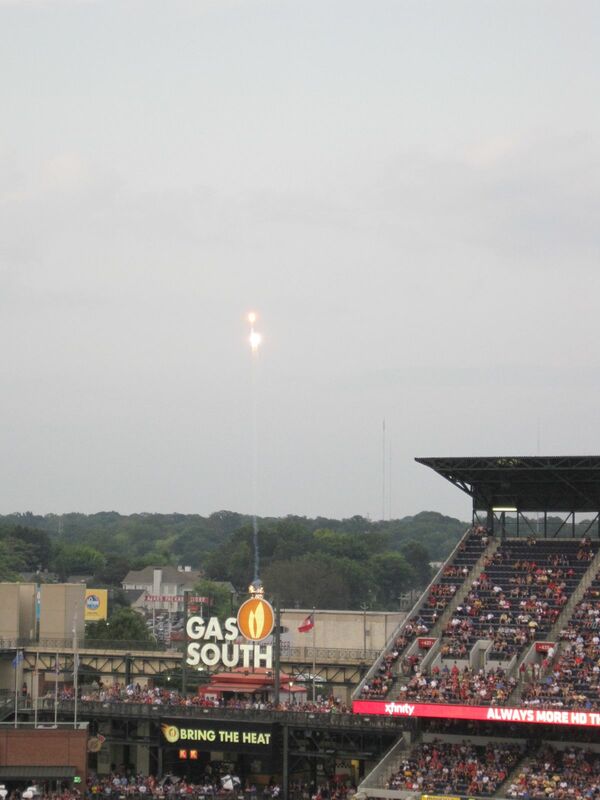 When the Braves strike out a batter, the Gas South sign launches two small fireworks and flames fly out of the flames on the sign. Then, if you squint, you can see the letter “K”s underneath the words “Bring the Heat”. One “K” per strikeout. And if there’s a home run, the 40-foot Coca Cola bottle launches a WHOLE BUNCH of fireworks! This was during the one-and-only home run from both games: Dan Uggla in the 4th inning. Dave took the boys to get snacks. I saw it, they missed it. 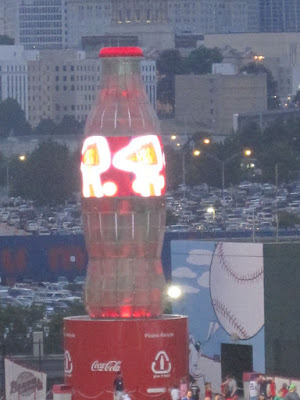 A word about this 40-foot Coke bottle. The area that’s usually a label is actually an LCD sign that is constantly changing. Here you can see the tomahawks that were moving around the right. Timmy was a bit freaked out by every single digital sign in the ballpark showing tomahawks during the tomahawk chop music. He learned the cheer pretty early on! The Sunday game gave us a MUCH better view! Unfortunately, the seats remained in the sun the entire time. After 3 hours in the sun, during about the 7th inning, we moved to shady seats two rows up. Those original seats were in the very front row of the upper deck, behind home plate. About halfway up in the stands…definitely foul ball range! A most-awesome view! Meanwhile, my boys were in tears…Timmy ran back over to the original seats and sat with his glove at the ready for about 10 minutes. Jacob was pretty upset for the rest of the game. Dave — whose original seat the ball landed in — explained that he wasn’t really paying attention at the time the foul ball came in and assured the boys he might have gotten hit on the head. Nice foam tomahawks, right? This was before the foul ball — and the emotion that went with it. It fell right into the seat Dave was sitting in here…except we had moved from those seats when the ball came in. I thought the sun would head behind the awning…instead it PARALLELED the front edge of the awning. So hot…so frustrating. When Jacob and I went to the box office to get the Saturday night game tickets, we learned of this “Running of the Bases” activity the Braves hosted on after their Sunday home games. The kids line up after the game to go down to the field and they get one pass around the field. After yet another loss against the Cubs, not to mention the Foul Ball drama, we weren’t sure the kids were going to handle the LONG line to run the bases. The kids didn’t know what to expect, so it was clear Dave and I were more excited about this than the kids. But they stuck it out, with the help of some other kids in the line who had done the activity before and assured the boys that the experience was really cool. I knew Jacob would appreciate learning how much longer the baselines are on a Major League diamond compared to what he runs in Little League. After about a 30 minute wait (relatively not long at all), we saw the beautiful field up close! The kids were put in a line and the whole experience — as cool as it is — is very very fast. They are sending kids out about every 2 seconds. I didn’t get good pictures of the running itself, but here’s a video of the boys that gives you an idea. Yes, Timmy’s wearing a Pirates shirt. Those two shirts came from Old Navy. The kids in the line leading up to home plate. Say nothing about the boys being in Crocs (J’s wearing yellow, T’s wearing red). I didn’t think about how much better this experience would have been if they were wearing sneakers. The boys received free t-shirts when they finished. The Braves logo is on the front, this beat any $20 t-shirt at the souvenirs stands! Photo courtesy of Field Trips With Sue. The boys kept seeing ads for this Braves Kids Club on the video screens and on posters throughout Turner Field. This evening I finally remembered to look up the website and see what this Kids Club involved. Seems like a pretty cool deal. I was reminded of the old Lego Brickmaster Club from about 2007 or so, when $40 would get you 6+ great little kits, plus coupons, and the magazine. For $20 you get 2 Braves ticket vouchers AND 2 Gwinnett Braves (their AAA affiliate) vouchers. Plus a ball cap, Chick Fil A coupons, a certificate, VIP access to the Kids Running of the Bases, among other things. Since a Kids Club membership is valid for a single baseball season, we convinced the boys that this wouldn’t be a good idea this late in the season. I put a reminder in iCal to look at the Kids Club membership thing again in mid-November for the 2012 season. This Atlanta blogger shows how the Kids’ Club items are nicely packaged up for the holidays.